forming strong relationships and helping them build the skills they need to navigate life. 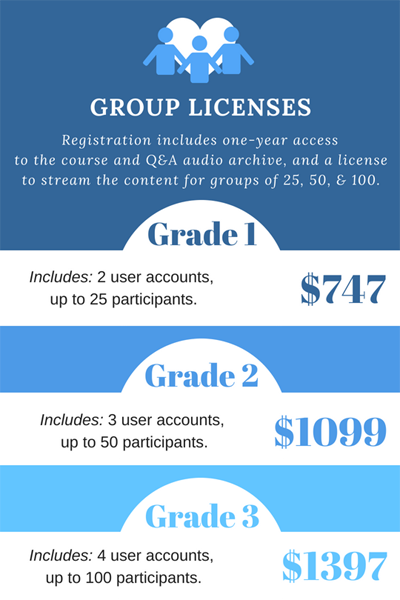 Individual registration and group licenses available. coping with stress, managing academic expectations, or regulating emotions? According to the American Psychological Association, a significant number of children in American society are exposed to traumatic life events. Trauma during childhood not only affects children's behavior, but also their ability to learn, cope with stress, and form healthy, positive relationships with others. If traumatic experiences are ignored and left unaddressed or when trauma-sensitive care is lacking, children retain poor coping strategies that can negatively impact their long-term mental, physical, and emotional health. Children who have experienced chronic stress or trauma often lag behind their peers in areas such as academics, self-regulation, and social skills. Parents, teachers, and caregivers may mistakenly assume that these children need firmer discipline or more structure. In reality, they are struggling with powerful fears, feelings of disconnection, anxiety, and/or sensory overload which they are unable to manage alone. This is where ONE STRONG RELATIONSHIP can make all the difference. As the parent, teacher, or caregiver of a traumatized child, you have been presented with a unique set of challenges. If you want to help a child heal from a painful or frightening past, you must not only learn to tolerate the child's sensitivity to normal stress, but also learn to manage your own reactivity. You may feel unprepared to handle the intensity of your child's behaviors. You may be worried that without consequences, the apparent lack of motivation, disruptive behavior, or explosions of anger (which seem to appear without cause) will never stop. If you have not been taught to understand how the brain adapts to stressful situations or how negative behaviors like inflexibility, resistance, yelling, and emotionally shutting down previously kept a child safe, behavioral change can be difficult to achieve. This series will show you how relationship and compassion for a child's experience can be a catalyst for healing - prompting the brain to "catch-up" and strengthen the child's skills. Children have the potential to thrive beyond trauma - if you focus on the three key areas of support outlined in this program. The goal of this web-based training program is to provide parents, caregivers, and other adults who work with children with a new understanding of behavior along with the resources, community, and a model of discipline that addresses the unique attachment needs of children with trauma histories. In these on-demand lessons, you'll learn strategies for effective communication which will build executive function skills such as planning, thoughtfulness, attention, and self-regulation. You'll learn tools to improve family relationships, increase motivation, and strengthen your bond - creating influence that lasts. Routines are highlighted to help you learn to create safe spaces which enhance emerging skills such as empathy and problem-solving and promote your child's social-emotional competence. You'll learn how to focus on working with a child’s emotional age and developmental stage rather than chronological age (which can appear vastly different) while targeting specific school and family issues and communication difficulties you may be facing. Community support is provided in our online forums where you can connect with fellow parents and professionals. Create behavioral change through a trusting relationship with your child. Address the root cause of behavior without anger or punitive consequences. 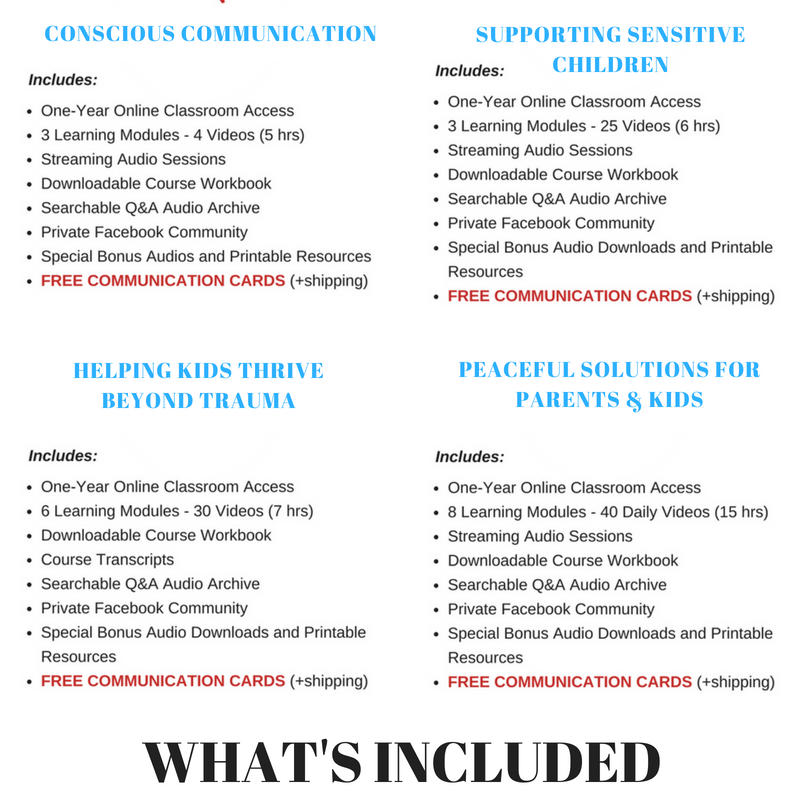 Feel competent and capable of handling your child's stress + school challenges. 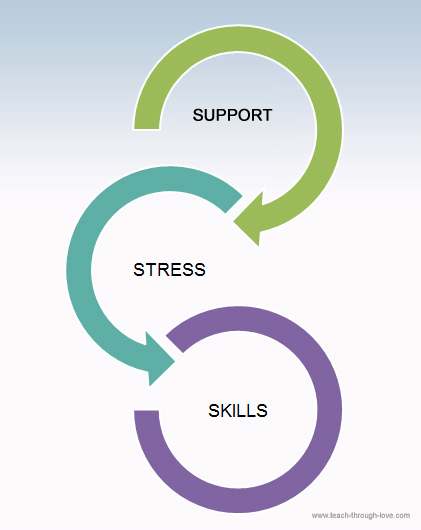 Build upon current skills and emerging capacities with our state-stress-skills model. Teach respectful communication which builds influence. Feel and understand the purpose of their feelings. Heal the pain from past experiences. Self-regulate their emotions and behaviors. Expand their tolerance for frustration. Form healthy relationships with peers and adults. Build skills which help them focus, learn, and remember. Lori has a gift for taking the ideas of conscious parenting and making them concrete by teaching us how to communicate in new ways. Our parents raved about Lori's classes. You have transformed out house. We recently purchased your series and it is has already touched me so deeply. Your insights are helping me to grieve for my own childhood and to see the patterns that I have been unconsciously repeating. Everything I have ever read about parenting previous to discovering your work has never felt right to me. There has always been a part of me that has known that using my love for children as a way to punish and reward them is just wrong. Reading your work and listening to your classes has helped me to see that my inner voice was right all along. I have done a lot of spiritual and emotional work in my life and one of the concepts that I have spent a lot of time with has been moving from ego to spirit. When I am learning about changing paradigms from fear based parenting to love based parenting, I see this as moving from ego based parenting to spirit based parenting. Everything I am learning in your classes resonates with me on a spiritual level. Thank you so much for making this invaluable information available!! You are truly changing the world with the work that you do! Thank you so much, Lori , for this valuable, supportive and very helpful information. My husband and I feel empowered and comforted ourselves knowing that we now have better tools to be better parents to our son. I can't say enough about the practical advice you get from this seminar! Not only by what Lori teaches, and not only by the examples she offers, but the way she problem solves with the seminar participants and also, just the way she speaks and her demeanor during the seminar! I learned how to speak much calmer and clearer (perfect for kids!) by listening to her example! She also intently listens and strives to understand all the seminar participants- what an excellent example in empathy that was for me, as well. This seminar helped my parenting take a swift turn in the right direction. It's worth every penny. 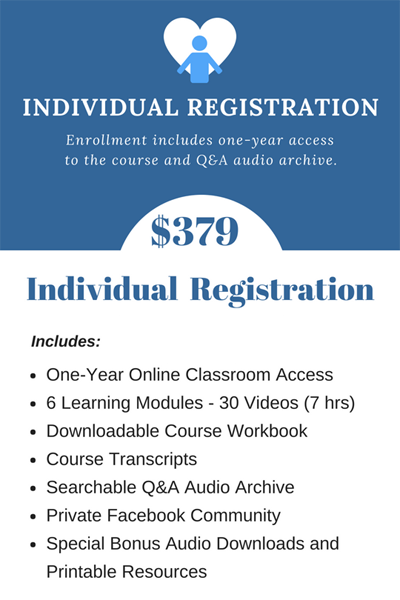 Immediate access to on-demand audio/video lessons + transcripts for self-paced learning. Companion workbook with activities and exercises to help you implement the concepts. Private Facebook Group to share stories and connect with others in the community. How trauma affects behavior, and shapes development, and informs the child's ability to self-regulate. Strategies for using storytelling and play to decode behavior and calm persistent fears. Rituals and routines that promote connection and increase positive behaviors at home and in school. How to recognize and engage a child stuck in fear-mode and help them adapt to change and obstacles with more ease. What the brain needs to grow new connections and make long-term changes in behavior. To help kids manage their emotions through your connection - instead of consequences. How the senses can become easily overwhelmed causing inflexibility and negative behaviors. How the body is triggered into fight or flight and how to stop the alarm system with mindfulness. Tools for creating connection, building positive coping skills, and learning to tolerate difficult times. How to use discipline that doesn't create disconnection and resentment. How healthy attachment promotes positive behaviors and reduces stress in the whole family. How to promote a secure emotional connection by removing judgment and evaluations from your language. How to help children build caring relationships with adults and peers. How to communicate with an angry, sensitive or resistant child. Why we get angry and how we can use anger to make necessary changes in our lives. Why knowing your family history will help you teach/parent children more effectively. What you need to set-up a safe environment that provides tools for kids to manage their anger. To implement a program of daily self-care to help you shift your perspective and stay emotionally available. How to set personal boundaries for your mental, emotional and, physical well-being. Why kids "don’t listen" and what you can do to make sure your limits and requests are heard. How to view behavior through a non-judgmental lens and support children as they practice new skills. How to express care and concern without trying to control or force your child to change. A 4-step framework for trauma-sensitive communication that eliminates arguing, negotiation, and permissiveness. How emotional, mental or physical trauma shapes a child’s perspective of the world and others. Tools for using empathy to connect and heal misunderstandings and navigate conflict. Strategies for accessing compassion and strengthening empathy in children. What to do when empathy seems like it isn’t "working" and how to talk to your child's teachers. Not sure? FInd the right course for you. Individual registration, and group licenses and connected user accounts are provided for a term of one year from the original date of purchase and automatically expire at the end of the term. Individual registration is for personal, home use ONLY. 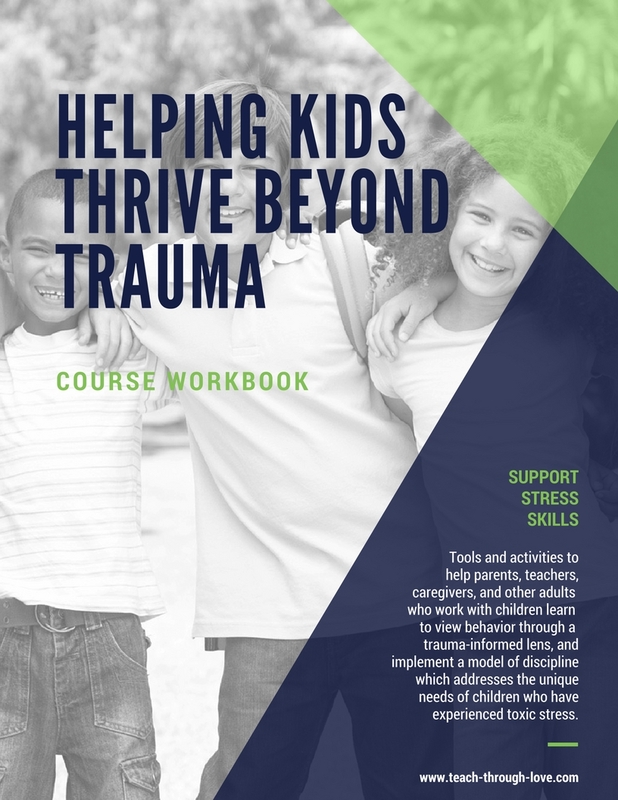 Your group license purchase creates a limited license to use and present the Helping Kids Thrive Beyond Trauma course and course materials ONLY to small groups associated with your organization. After you complete your payment, please log in to your student dashboard and and visit the "Getting Started Tab" in the virtual classroom to access your course. All digital sales are final, please purchase with care. Site license and user accounts, including login information and course links, may not be shared, posted on any website, resold, or used for profit. ANY UNAUTHORIZED USE, COPYING, OR REPRODUCTION, INCLUDING ANY AND ALL DIGITAL DISSEMINATION, OF CONTENT IS STRICTLY PROHIBITED. Helping Kids Thrive Beyond Trauma course content, including but not limited to intellectual property as well as any images, photographs, animations, video, audio, music, text, electronic applications, and accompanying printed materials incorporated into Helping Kids Thrive Beyond Trauma course materials are protected by copyright and owned by TEACH through Love and Lori Petro. 4. WHAT'S BENEATH THE SURFACE? 5. WHAT DOES EMPATHY SOUND LIKE? Take the Survey - Add Your Thoughts!